Terence (born as Publius Terentius Afer in Carthage, Tunisia) was a famous Playwright from Rome, who lived between 185 BC and 159 BC. Publius Terentius Afer, best known as Terence, was a Roman comedy writer. The nickname AFER, "African", tells of his origin, perhaps from Carthage and the Roman site in Libya. 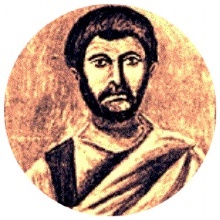 Terentius Lucanus, a Roman senator, led Terentius to Rome as a slave, educated him and later, impressed by his abilities, freed him. Terentius died at a young age, probably in Greece or on the journey back to Rome. He only managed to write six comedies, all published between the years 166-160 BC, but they are all preserved for posterity. Terentius is next to the main Roman Plautus comedy writer. He is less bold, and the hallmark of his comedies is a well-detailed language and a sophisticated comedy. He portrayed the bourgeois everyday life with its marital strife, love, adventure and reckless sons. The prototype was, as in Plautus, the Greek nykomedier, especially Menands. Our collection contains 34 quotes who is written / told by Terence, under the main topics: Design, Motivational. "I am a man, I consider nothing that is human alien to me"
"Perhaps believing in good design is like believing in God, it makes you an optimist"
"So many men, so many opinions"
"The anger of lovers renews their love"
"I take it to be a principle rule of life, not to be too much addicted to any one thing"
"Nothing is said that has not been said before"
"In fact nothing is said that has not been said before"
"How unfair the fate which ordains that those who have the least should be always adding to the treasury of the wealthy"
"While the mind is in doubt it is driven this way and that by a slight impulse"
"There is a demand in these days for men who can make wrong appear right"
"She ne'er was really charming till she died"
"Many a time from a bad beginning great friendships have sprung up"
"I am a man, and whatever concerns humanity is of interest to me"
"How often things occur by mere chance which we dared not even hope for"
"He makes a great mistake... who supposes that authority is firmer or better established when it is founded by force than that which is welded by affection"
"Extreme law is often extreme injustice"
"Children should be led into the right paths, not by severity, but by persuasion"
"Their silence is praise enough"
"Nowadays those are rewarded who make right appear wrong"
"Lovers quarrels are the renewal of love"
"I am a human being; nothing human can be alien to me"
"You're a wise person if you can easily direct your attention to what ever needs it"
"They who love dancing too much seem to have more brains in their feet than in their head"
"They are so knowing, that they know nothing"
"I hold this as a rule of life: too much of anything is bad"
"For you to ask advice on the rules of love is no better than to ask advice on the rules of madness"
"Riches get their value from the mind of the possessor; they are blessings to those who know how to use them, and curses to those who do not"
"I do not give money for just mere hopes"
"Human nature is so constituted, that all see and judge better in the affairs of other men than in their own"
"Of my friends I am the only one left"
"I am human and let nothing human be alien to me"